I’ll be honest, folks, there are days I just throw up my hands and think, there’s no use bothering anymore. It’s just impossible to open minds that are already set in their ways. I would put my life on the line for free speech and the right of the individual to their own opinions, but where’s the love? Can we disagree and still be civil to each other? Can we respect differing points of view and still be neighborly? Are we willing to learn from each other, to listen, or are we all just talking too loud to hear anyone else? There are wars going on in every facet of our lives. Military wars with guns and killing are just part of it. There are wars of words here at home, and everywhere, so much so I sometimes wonder, am I the only person who read Machiavelli? Isn’t anyone else out there aware of the fact that while we set our jaws and spew hatred at each other, we are just falling into a trap? Liberals vs. conservatives, people of faith vs. atheists, pro-life vs. pro-choice, rich vs. poor, black vs. white, blue vs. yellow, McDonalds vs. Burger King…hello, people, we’re missing the point here. We’re over-complicating our lives, our society, and our world. We’re too busy arguing amongst ourselves to take a walk outside the box. I don’t care if you’re liberal, conservative, religious, spiritual, atheist, purple with blue lumps or have three arms…choosing to be loving, or at the very least, neighborly, would go a long way towards improving our society. Instead of so freely making assumptions, throwing labels and accusations around, and blaming each other for whatever, we’d be better off setting aside one day a week to really read and listen to others, and maybe keep our mouths shut for a moment while we do. That goes for everyone – politicians, talk show hosts, bloggers, teenagers, senior citizens, celebrities, pet owners, CEOs, homemakers – I don’t care who you are or what you believe, none of us knows everything, none of us is 100 per cent right – and none of us knows the whole truth. We could all benefit from a little continuing education. Let’s find the love. Let’s find common ground. Let’s listen, learn and open our minds. Or is it already too late? “Your ability to share and consume information online may soon be limited…” Check out Save the Internet for more info. 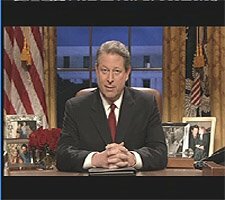 Here’s the trailer to Senator Gore’s new documentary on global warming.